Sports Rendezvous: Waidi 'Skoro' Usman: GOtv Boxing Night star to fight Fuzile for IBF Africa title in South Africa. Waidi 'Skoro' Usman: GOtv Boxing Night star to fight Fuzile for IBF Africa title in South Africa. Skoro made his name as the continental winner of the Gotv Boxing Night 14 in December 2017. 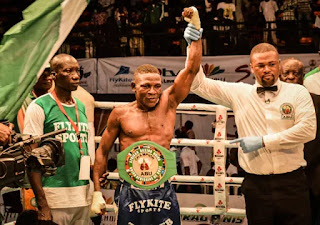 GOtv Boxing Night star and African Boxing Union featherweight title champion, Waidi 'Skoro' Usman of Nigeria, will on Sunday, July 29 face South Africa’s Azinga Fuzile for the International Boxing Federation (IBF) Africa super featherweight title. The fight will hold on Sunday in East London at the Orient Centre in South Africa. The boxer had has previously won the national and West African featherweight titles at different editions of GOtv Boxing Night. While Skoro will be battling in South on Sunday, the Gotv Boxing Night 15 will be happening at the Indoor Sports Hall of the Obafemi Awolowo Stadium on the same day. GOtv Boxing Night 15 will feature seven fights, including the African Boxing Union (ABU), lightweight title bout between incumbent champion, Oto “Joe Boy” Joseph of Nigeria and Ghana’s Nathaniel Nukpe.